Painting owned by the Union County Historical Society, painted by M.B. Mayfield of himself and his family going to church. The first of exhibit of 2019 at the Union County Heritage Museum will feature African American art from the Mississippi Museum of Art, “Image and Identity,” as well as art from the museum’s collection and private donors, featuring work from the late M. B. Mayfield and others. The exhibit will open January 17, 12 noon with Museum Moments. Guest speaker will be Australian film maker John Reyer Afamasaga who recently completed the film “Door Ajar,” a documentary of the life of M. B. Mayfield as well as a film on “The Moss Hunter,” about Henry Clarke, now living Oxford. Clarke, a former New York street artist who turns moss into art and medicine, will be present for the program. A light lunch compliments of The Junta Club will be available beginning at 11:30. 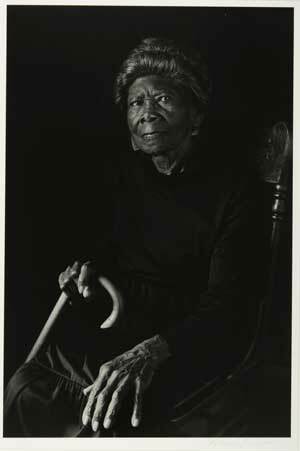 Roland Freeman (born 1936), Mrs. Viola Allen, Africatown, Alabama, 1985. gelatin silver print. Purchased from the Center for the Study of Southern Culture at the University of Mississippi. Collection of the Mississippi Museum of Art, Jackson, 1995.017. This exhibition brings together a selection of works by African American artists whose varied styles are unified here through their exploration of the human figure. Some self-taught and some formally trained, the artists here sought inspiration from their own experiences, memories, and the world around them, resulting in a rich collection of work that underscores the nuance and importance of African American identity. These works, spanning much of the 20th century, expand the dialogue about the power of self-representation and the aesthetic choices of the artist, whether introspective portraits, scenes of daily life, or striking abstractions. Artists featured include the above mentioned as well as Ernest Crichlow, James Denmark, Clementine Hunter, Mark Gail, Roland, Freeman, Gwen Knight, Dean Mitchell, Joseph Norman, Sulton Rogers, Earl Simmons, Mary T. Smith, Mose Tolliver, Kathleen Varnell, Arliss Watford, and Hale Woodruff. Image and Identity was organized by the Mississippi Museum of Art in Jackson and circulates as part of the traveling affiliate exhibition network. Works of art come from the Museum’s permanent collection and on loan from the collection of Myrna Colley-Lee. The museum is located at 114 Cleveland Street. For more information call the museum at 662-538-0014.